Oakhurst Neighborhood Association, Fort Worth, Texas: THIS THURSDAY: 30th Annual Oakhurst Police and Firefighter Appreciation Dinner! 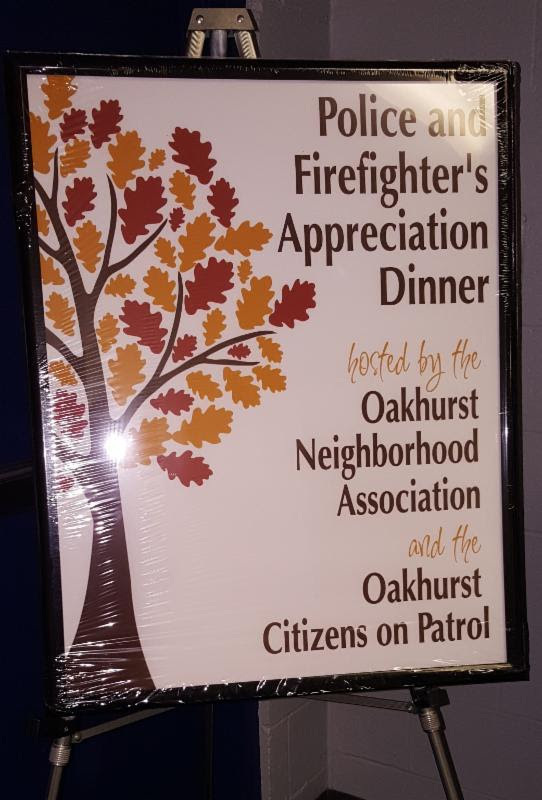 THIS THURSDAY: 30th Annual Oakhurst Police and Firefighter Appreciation Dinner! It's a BIG deal! It's a big enough deal that the mayor, the police and fire chief as well as our city councilwoman comes! For all the new members of our neighborhood, it's the Police and Firefighters Appreciation Dinner. 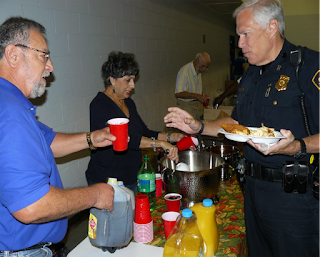 It is sponsored every year by Oakhurst Neighborhood Association and your Citizens on Patrol. This year, as in past years, it will be held at Springdale Baptist Church on the corner of Selma and Riverside Drive, in the gym and will be held on the 5th of October. It starts at 10:00 AM and runs until 1:00 AM the next morning. We serve all three shifts of the police, Medstar (EMT's) and Communications (911). We also serve the Firefighters, whenever they are able to come in throughout the day and night. This is a special year because it's our 30th year. You may have heard of other neighborhoods feeding the officers, but, as far as we know, ours was the first! It is also the last year that Fred and I will be leading the way. After ten years (longer than anyone) we have decided to step down and take a smaller role as "helpers". If you have never participated, let me tell you how it goes: All the neighbors bring sides and ONA supplies the Riscky's Barbeque (the folks at Riscky's give us the meat at a reduced amount). When we run out of barbeque, we supplement with ham or lasagna or whatever members of the neighborhood are kind enough to buy or make. ALWAYS: WE ASK THAT YOU BRING YOUR DISHES IN THROWAWAY CONTAINERS, unless you plan to stay and take your containers home when they are empty. If you are unable to make a dish, we accept cash donations to be able to buy what we need. Also: if you have never participated, there is a lot of hurry up and wait. Kind of like the Army. You are EXTREMELY busy for a while and then you wait for the next influx of Police and Firefighters to come in. During that time, the ladies and gentlemen of Oakhurst who stay to help, well, we talk. We visit. We get to know one another. I have made some of my best friends sitting in that gym, getting to know my neighbors. If you are new, it is such a good way to find friends. For me, some for life. For the "old hands" of this Dinner, from the bottom of my heart, Fred and I thank you for all your help in the past. We couldn't have done this without you. Thank you for ten years of anxiety, anticipation, hard work, joy and gratefulness. This is the best neighborhood in Fort Worth, hands down.